Ahoy, mateys! 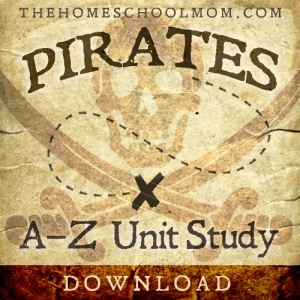 Get to know the pirates of old in this unit for ages 8-13. You will gather information on the history of pirates, where they sailed, what their lifestyles were like, what jobs they did, how they dressed, how they divided their spoils, and more. Visit the Pirates page for more pirate resources. Make a list of pirates known to have operated in the following centuries: 1500s, 1600s, 1700s, 1800s, 1990s and current day. Create a timeline using the data you have discovered. Using your timeline and the Pirates on the Seven Seas world map, color in the geographic areas where pirates are known to have sailed. Select two or three pirates from each century. Use a different colored pencil or create a unique symbol for each pirate. Be sure to include a legend at the bottom of your map. Has the location where pirates sailed changed over time? If so, why do you think that is? In the space provided below the map, write one paragraph listing three reasons to support your answer. From where do pirates come? What skills made a good pirate? Are all pirates male? Write one paragraph that answers these questions. You may substitute Buccaneer, Corsair or Privateer in your answer. List the types of jobs pirates did on their ships. Give a brief job description for each one.Example: First Mate – the first mate was the Captain’s right hand man and would assume command of the ship if the Captain unexpectedly became wounded or killed in battle. The first mate would need to have experience in navigation and have leadership skills. Jobs on Land vs. Jobs at Sea – Using the Land Vs. Sea Venn Diagram, list jobs pirates did on land and the jobs they did at sea. Which jobs overlapped? Put those jobs where the circles intersect. Select three famous pirates from history. For each pirate you select, write one paragraph, giving a brief biographical introduction, and including information about from where the pirate came, where he sailed, on which ship he sailed and why he is considered famous. How did this pirate end his career? See if you can locate a picture or drawing of the pirate, his ship or his custom flag. Investigate three famous pirate ships. For each ship you select, write a paragraph telling who built it, of what materials was it made, who sailed on it, where it sailed and what became of it when it was no longer being used. Look up information on each of the following navigational tools. In the space provided on the Nautical Terms Wordsearch worksheet, tell how to use the tools. Each of these tools can still be used today. Research and discover which of the follow statements are true and which are myths. For those statements which are false, give a reason why. Pirates believed that mermaids brought bad luck. The Flying Dutchman was the largest pirate vessel of the 1700s. Pirate flags were used to scare their enemies. Pirates made their victims walk the plank. Injured pirates received money for injuries received in the line of duty. Pirates used nicknames to prevent government officials from arresting their relatives back home. Sometimes pirates forced men to join their crew against their will. Peg legs and eye patches were common with pirates and helped to easily identify them on land. Read about pirate etiquette and rules. Write out three rules which you find most interesting. A Man ‘O War frigate could carry a full crew of 190 pirates. When the ship returned to the Caribbean, the crew had acquired 900 pieces of eight (poe). The crew count was at 90% when the Quartermaster began to divide the booty. The Captain receives two shares, the Quartermaster receives 1.5 shares, and the two Gunners receive 1.25 shares of the money. The remaining crew receives 1 share each except for the two newest cabin boys, which only receive ½ share each. How many crew members are on the Frigate? How many shares total must the booty be divided? How much does the Captain, the Quartermaster, the Gunners, the remaining crew and the apprentice cabin boys receive? Place 20% of the booty in reserves on the ship for future payments. These payments would be to compensate pirates for loss of limb or loss of eye during their voyage. How many pieces of eight are remaining after restocking 20%? How many pieces of eight are held in reserves? How much do the Captain, the Quartermaster, the Gunners, the remaining crew and the apprentice cabin boys receive? Pirating A to Z: Discover how the following items are important to the pirate world.